6.77 points at 35 votes (rank 414). This game already possessed ground-breaking features for 1983. On the one hand it was the milage and what carried even more weight: the tyre wear. The more often the car offends somewhere, the stronger the tyres are strained - and each of the four tyres individually. The state of the tyres is shown by colour markings on the contact surface. New tyres have first the colour dark blue and with rising abrasion it changes: light blue - green - red. When the tyre is red, a few further contacts are enough to lead to the premature out. The car explodes. Damaged tyres can be changed in the box, the wit is: you have to do it yourself. The player steers a mechanician that carries the tyres to and fro and also changes them. Everything goes anything but fast, however, it is an enriching feature. The tyre sneaker is long ago a classic! Not seldem are races decided in the box. Also the refuelling needs to be done in the box. Hereby you need to look out for the tank indicator, as overfilling the tank leads to an empty tank and you need to start again. 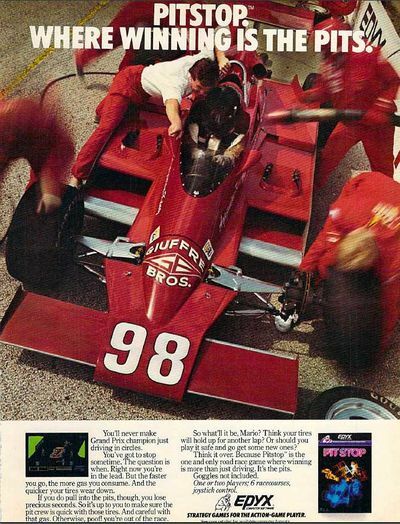 The graphics are rather extensive for 1983. Concerning the sound Pitstop is unfortunately rather meagrely equipped. You will hear relatively loud motor noises which are not really authentical. At the beginning of the game the number of players (1-4) and the number of rounds (3, 6 or 9) are set. After that you choose one of three difficulty levels (Rookie, Semi-Pro, Pro) and finally whether you want to do a simple (Single Race), a bigger race (Mini-Circuit, 3 races) or a championship (Grand-Circuit, 6 races). If you have chosen Single Race, you then pick the desired track. When doing Mini-Circuit 3 tracks will be chosen randomly. In Grand-Circuit you drive all 6 tracks, whereby the order is also chosen randomly. Very narrow track The racer's graveyard! There is no boundary construction at the track, in return the track is zoomed very fluently. The graphical design of the fast cars is also successful. The cars can well be steered by joystick through the course. To the courses: Except of the routeing nothing changes. The road is always flat, light grey, the kerbstones red-white and the turf is green. Every now and then an advertisement appears at the roadside. There is no great graphic diversion. 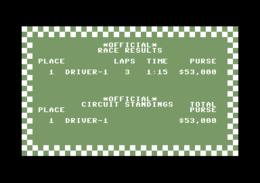 The cars of the player are totally identical concerning the road performance. Exciting races are preassigned. 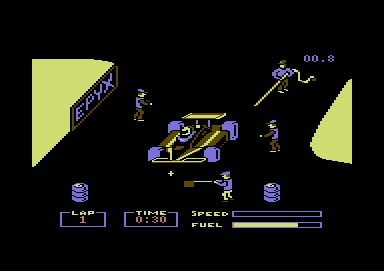 However, the races of every player are driven one after the other. The other cars that appear during the race and need to be overtaken are only dummies. A really strong cut. A highscore list is completely missing. 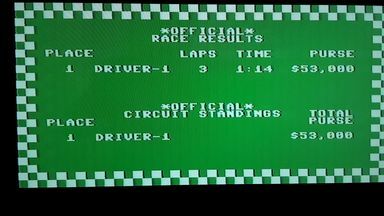 Only the resulst after each race are presented. Controlling is done comfortably by joystick and doesn't need any further explanation, it is kept very simple. 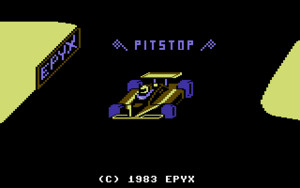 In the box: use joystick to place the cursor (+) to a crew member. Press fire button to steer it now. To go back to the cursor press the fire button again. To fit a new tyre, take the tyre to be changed with a crew member from the car and bring it to the stack of tyres. Go with the new tyre back to the car. To refuel steer the crew member with the fuel hose to the back part of the car. Do not overfill the car as it then needs to be filled anew. To go back to the track, let all crew members step back and then go with the cursor to the crew member with the flag. After a race is finished a new one can be started with the fire button. The solution to the game is simple: the one who drives faster is first on the finish line... it is not that simple, as especially in the box you should not waste too much time. So: treat the tyres with care, do fast pit stops and drive in a petrol-saving way! To save valuable seconds in the box you can refuel and change tyres at the same time. The version by "Remember" offers next to the manual the following options: unlimited fuel, no tyre damages, no overfilling of the tank, no collision. Shakermaker303: "Well, the successor Pitstop 2 is much better. Alone the design doesn't look very much like racing track, as the red/white border markings are missing. The sound is also not so great. 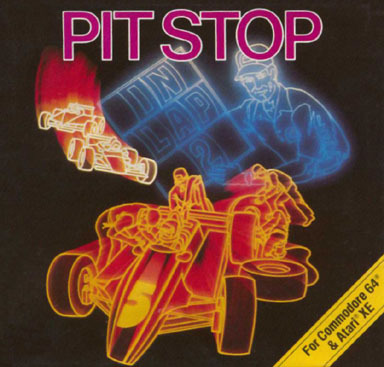 But it can be steered well and the screen of the pit stop is done nicely. I like especially the in the background driving racing cars, that are sound-technically well done. This has pit stop feeling! Altogether 7 (felt 6.5) out of 10 points." Here the fastest time in a single race of your choice counts. Three rounds need to be done. This page was last modified on 7 February 2019, at 12:15.